Less than a week after retaining Sunil Chhetri and Udanta Singh, Bengaluru FC have added to their arsenal in signing Australian midfielder Erik Paartalu on a season-long deal. The Blues have also retained defender Juanan Gonzalez who will join John Johnson for another season at the heart of Bengaluru’s defence. 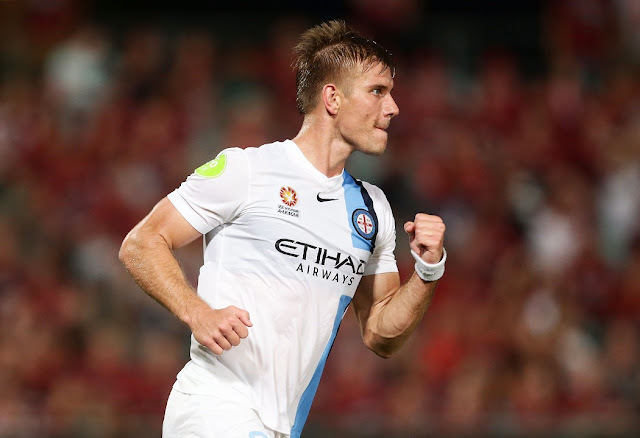 Towering at 6’4″, Sydney-born Paartalu began his career in the National Soccer League, now the A-League, with Northern Spirit. His stints in Australia included three seasons with Brisbane Roar when they played AFC Champions League football. At Brisbane, Paartalu won two Championships and one Premiership and played 85 consecutive matches while setting an Australian record of any sporting code with an unbeaten streak of 36 games. Paartalu moved to Chinese side Tianjin TEDA FC in 2013 before a switch to Thailand with Muangthong United the following year. He was also part of South Korean side Jeonbuk Hyundai for a brief period in the season that side went on to win the AFC Champions League. The midfielder earned his first senior national team cap in 2012, playing in a World Cup Qualifier for the ‘Socceroos’ against Saudi Arabia. “I was really excited by the Bengaluru FC project because it is a club that’s doing really well for itself in an expanding market. Indian football is getting bigger and bigger. It felt like the right project to get involved with. I spoke with Cameron Watson and he sold it to me in terms of where the club is. They’ve been very successful in the last four years and are looking to make major steps in the Indian Super League,” said Paartalu. The 31-year-old was confident that his experience in AFC competition will prove handy for the Blues who are gearing up for their inter-zone semifinal in the AFC Cup against North Korean side 4.25 SC on August 23. Bengaluru FC coach Albert Roca said he was confident of Paartalu bringing his experience to the table as the club attempts to rebuild the squad this season. “A lot of things change for us this season and experience is what will play a key role during this phase. Erik brings that kind of experience with him and I’m certain he will be a vital figure at Bengaluru FC,” said Roca.